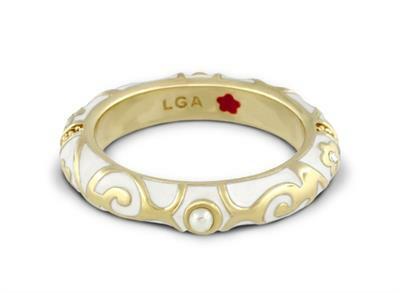 The Fiesta Pearl Ring is an elegant addition to the Lauren G Adam stacking rings collection. This chic design is 18K Gold plated and delicately decorated in White Enamel and detailed with Swarovski Crystals and a beautiful White Pearl. Lauren G Adams Rings come in three sizes a 6 (equivalent to a UK L) 7 (equivalent to a large UK N) and 8 (equivalent to a large UK P). In a rainbow of colours with fabulous designs, these beautiful rings are designed to be stacked and complement the Enamel bangle collection - which will you choose?